“add-apt-repository” is an Ubuntu-specific script to add or remove repositories which, among others, automatically imports the public GPG key. For more information, see its man page. You can use “add-apt-repository” in Debian to add Launchpad PPAs however, there are a few things that you should know. Read on to find out how to use “add-apt-repository” in Debian. Creating a mail server on Linux powered machines can be one of the most essential things that every system administrator needs to do while configuring his servers for the first time, if you don’t know what it means; it’s simple, if you have a website like “example.com”, you can create an email account like “username@example.com” to use it to send / receive emails easily instead of using services like Hotmail, Gmil, Yahoo Mail.. etc. Are you troubling with full of unused packages that occupies more space and slow down your operating system performance? Well, you should try these two awesome utilities that help will you to easily find and remove the orphaned packages on your hard drive. Well, What is an Orphaned package? Simple, Orphaned package is an unwanted package which is no longer necessary. As you may know, whenever you install a package, it will install along with other packages(dependencies). After removing the package, not all the dependencies will be removed completely. Some dependencies might still exist and dumbs the hard drive space after removing a specified package. In this tutorial, We will discuss how to find and remove the orphaned files in Debian, and RHEL based systems. If you’ve ever used Debian or a Debian based distribution like Ubuntu or Linux Mint, then chances are that you’ve used the APT package system to install or remove software. Even if you’ve never dabbled on the command line, the underlying system that powers your package manager GUI is the APT system. Today, we are going to take a look at some familiar commands, and dive into some less or more frequently used APT commands, and shed some light on this brilliantly designed system. EasyEngine (ee) is a Linux shell-script to install and manage wordpress-nginx websites in one go. Using EasyEngine, you can install Nginx, PHP, MySQL, Postfix, phpMyAdmin and their dependencies in one shot easily without the help of a System administrator. It makes very easy to install and manage wordpress-nginx websites, and you don’t have to manually install each packages and memorize all commands. Everything will be done automatically on the background. EasyEngine will work on Ubuntu LTS versions such as Ubuntu 12.04/14.04, and Debian 6/7 version. Unfortunately, there is no support for RPM based systems like CentOS, and there is no future plan to make it work on RPM based systems right now. 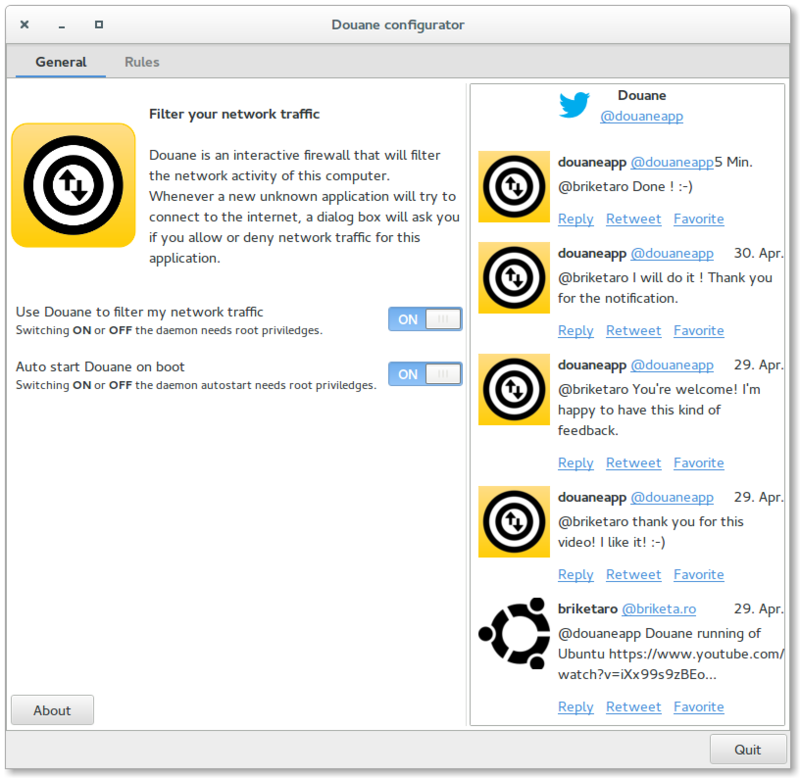 The Linux equivalent of Little Snitch, ZoneAlarm, and similar per-application firewalls? EDIT: Also see OpenSnitch: The Little Snitch application like firewall tool for Linux. If you are a Mac user, you’ve probably heard of Little Snitch. It’s a commercial (as in, not free) program that lets you allow or deny connections to the Internet from individual applications. 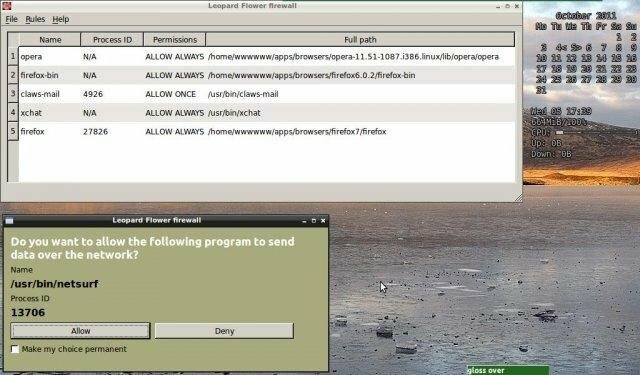 One reason for using such a program is to detect software that should have no reason to connect to the Internet nevertheless attempting to do so. For example, you download a free screensaver (dumb move to start with) and it sends all the personal information it can find on you to some group of hackers on the other side of the world. A program like Little Snitch would let you know that the screensaver is trying to connect to the Internet, and allow you to deny that connection. In the Windows world, I believe that ZoneAlarm has a similar capability, and it’s also a commercial (as in, not free) program. The only downside to this one is that as of this writing the only available package is for Arch Linux but if you want to try to build it for a Ubuntu or Debian system, they provide a page showing the needed dependencies. There is an older similar program called TuxGuardian but apparently is hasn’t been updated since 2006, so I have no idea if it will even work with current versions of Linux. And as for you Android users, try the NoRoot Firewall app. Posted in Android, Debian, Linux, Linux Mint, privacy, Security, software, UbuntuTagged Computer program, Linux, Personal firewall4 Comments on The Linux equivalent of Little Snitch, ZoneAlarm, and similar per-application firewalls?